Beef burgers with fried cheese and chips, Middle Eastern olive oil and spices for dipping bread, tacos with different toppings. You can travel the world at this London food festival - and every last bite is halal. The Halal Gems Street Eats festival reflects both the food diversity and the trends popular here in East London's fashionable Shoreditch area. It's a part of the capital where lots of Muslims live and it is also has a thriving and ever-changing food culture, with street food and pop up restaurants attracting plenty of young Londoners. "Muslims are hugely interested in foodie culture. So if you imagine, in the halal conscious lifestyle, if you're not drinking, what are you doing? You're eating," says the festival's founder Zohra Khaku. "So really, Muslims eat out a lot and statistically we spend a lot more money on eating out than non-Muslims do. So the idea really is to make sure that halal-conscious diners a have place to go to, and here we are." The word 'halal' is most commonly used in reference to meat, but it actually refers to any object or action which is permissible for Muslims, as set out in the Quran. In the case of meat, Islamic law requires that animals are alive and healthy at the time of slaughter, are killed by hand, have prayers of thanks recited over them, and have all blood drained from the carcass. As well as using Halal produce, the festival is showcasing fusion foods that combine Middle Eastern influences with the latest London foodie fads. One stand attracting those with a sweet tooth is Darlish Creamery. From sweet cream and sour cherry to chocolate and halwa, this mobile ice cream parlour draws heavily on Persian Muslim culture. Laura Dawson, the founder of Darlish Persian Creamery, says she blends chocolate with traditional Iranian halwa which is made from sesame seeds. "Chocolate and halwa is going on, and this one is just inspired by the sesame candy that we'd normally have with coffee or as a sweet treat. Everyone will say, 'oh I remember halwa when I was a child', so we made a chocolate with some chunks of halwa in there," she says. Muslims make up 4.8 percent of the UK population, according to the 2011 census by the Office of National Statistics. 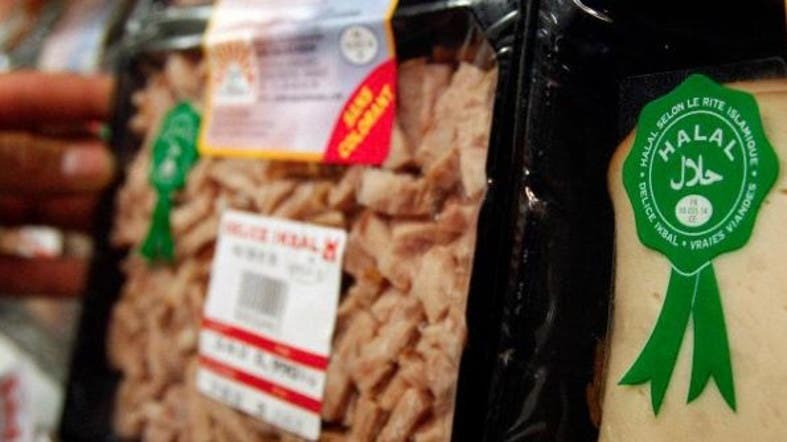 The Muslim Council of Britain says that the UK halal food industry is worth over three billion UK pounds (approx. 3.9 billion US dollars). Asna Qamar, who's originally from Pakistan, is offering a halal take on the popular Burmese noodle dish Khao suey. "It's essentially a bowl of noodles with a coconut soup, slow cooked chicken or pulled beef and lots of crunchy things that go on top, from a homemade chilli sauce, a prawn crumble, we have spring onions and lots of lime and lemon," she says. Zohra Khaku says there is much more to Muslim food than tradition. "Muslims love eating different types of cuisine, and it's actually quite novel, the different types of things you can find in London, so here at Street Eats for example we've got things from curry to halloumi fries and burgers and all sorts of things. It's really very exciting." Halloumi is a firm, chewy white cheese that hails from Cyprus originally and is made from both cows' and sheep's milk. It lends itself particularly well to grilling and frying. At this stall called Oli Baba's, strips of halloumi are served like fries with North African seasoning - a combination of yogurt, pomegranate molasses and mint leaves. They certainly seem to be going down well with diners - and the festival as a whole seems to be getting the thumbs up. Tasnim Chowdhury says she's enjoying the variety: "It's really good, it's got such a good selection and it brings loads of different places together." "It's really exciting as well that we can get to try so many different things. So I'm really looking forward to lunchtime. We're just trying some tasters at the moment," says her sister Fayeka Chowdhury. And when they get round to desert, there are plenty of sweet treats like these halal-gelatine gums and cupcakes with alcohol-free frosting. Safia Awil says she feels really comfortable at the festival because no alcohol is being served. "I really love the idea of the fact that it's like a halal festival, it's alcohol free, so it's like we don't have to kind of worry about, is it going to be non-suitable for us? It's just open for all and that's really nice, I feel like." And it's not just Muslims who are enjoying all the Halal delights on offer. "We've seen the halloumi fries, we're getting quite excited about the halloumi fries and then we're moving onto the Persian ice cream after that, with maybe a few bits in between," says Emma Patterson. And if you want something naughty but nice, that fast food classic the beef burger is getting the gourmet halal treatment. Zeeshan Amin, owner and CEO Band of Burgers, says he has a new burger on the menu, featuring a gut-busting fried cheese patty on top of a thick charcoal grilled beef burger. "We're doing our new burger here at this festival, which is a fried cheese patty with a delicious beef. In our beef actually we use different cuts of cow and I'll explain a little bit about our beef. It's basically, there are five secret cuts that we use to make it more juicy for the customers and I'm sure everybody will love the burgers here," he says. Amin's new giant offering looks like its already attracting some fans.